Arterial Motives May 31 - October 31, 2014. Opening reception - Saturday May 31, 1-5pm. In response to growing uncertainty over the future of our local Route 41, Street Road Artists Space presents Arterial Motives, an exhibition of artworks from four continents, all of which highlight a fundamental issue of contemporary life in our increasingly car-centric world: automotive traffic. Like many roads, Route 41 has many different users and competing functions: it is a key arterial for goods, and farming, but also is situated in a substantial land preservation area and near Amish country - both celebrated for their rural qualities. At a moment when the Pennsylvania Department of Transportation is running studies for a traffic light at Street Road's intersection (at Routes 41 and 926), and regional development drifts towards a return to pre-2008 unchecked sprawl, Arterial Motives takes in different kinds of traffic use and planning through the eyes of artists from around the world. These works remind us that on our globalized and motorized planet (the number of vehicles worldwide surpassed 1 billion in 2010 and is projected to grow to 2 billion in 2020) traffic incessantly ebbs and flows. It holds us hostage or propels us forward, inspires horror, frustration and occasionally awe, while also revealing our changing attitudes towards land, mobility and ultimately one another. Maider Lopez’s Ataskoa is an intervention – documented in a series of photographs – that transposes a prosaic and inherently urban / suburban phenomenon to the Spanish countryside, where a traffic jam becomes a social gathering. Underneath by MAP Office (Laurent Gutierrez and Valérie Portefaix) is a stunning documentation of life under a 63-kilometer raised highway loop surrounding the Chinese city of Guangzhou. This sprawling city-inside-the city forcefully imposes its haphazard logic onto the urban landscape, creating surreal propositions for land use in our emerging global metropolises. Taking a grassroots method of infrastructural observation into an archival mode, Underneath (2004) consists of a series of photographic lightboxes and a video documenting life under the highway loop surrounding Guangzhou, a “private empire” with undue influence over economy, geography, and culture owned by the Hong Kong corporation Hopewell Holdings. The video and photographs include images of landfills, plants, stores, intersecting surface roads, food carts, pool tables, motorbikes, restaurants, televisions, polluted water, furniture, parked trucks, chickens, message boards, graffiti, and, to the sides, new villas, traditional villages, farms, factories, and shopping malls. In the case of the illuminated photographs, boxes of text refer to actions like trading, perceiving, inventing, and following, all taking place beneath this line with no vanishing point—a literal figure, as the highway is actually an infinite ring that carries with it electric lines and canals towards lesser developed areas just as it ferries people and goods towards more urbanized centers. 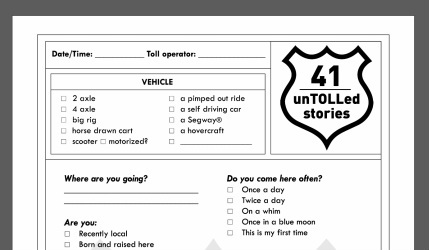 Danny Aldred’s The Road Less Traveled invites everyone to share experiences of Route 41 by fax machine. Images of or from the road flow into the gallery and transform the thermal paper roll into another kind of road. Fax yours to 1-610-869-ROAD. The organic shift in traffic patterns at the intersection of Street Road and Route 41 inspired Emily Artinian and Felise Luchansky’s unTOLLed stories. With this performative toll booth the artists hope not only to expand the conversation on land and road use, but provide the relevant authorities and local communities with valuable information. Patterns of movement evolve over time to accommodate the needs of people in motion. Footpaths become lanes, lanes become roads and roads create intersections. Movement from point A to point B often adapts and changes as traffic increases. The most direct route may become too congested or dangerous. Systems of alternative routes evolve. An example of this type of change in movement is the organic shift in the traffic pattern at the intersection of Street Road and Route 41. Drivers are choosing to trespass on the Street Road site to avoid this intersection. Is this for convenience or safety or expediency? unTOLLed stories seeks to discover the reasons for this shift. In this installation, when motorists enter the property, they will be asked to participate in a short survey. In exchange, unlike at conventional tollbooths, the motorists will receive a toll for their input in the project. The information gleaned from this form of traffic update will be brought to the attention of the authorities for further study with the hope that this interchange exchange can provide a dialogue between citizens and governmental actions that impact their lives. Adrian Barron counteracts the urbanization of Chester County’s rural landscape with a planting of 1000 acorns. This Supervene Forest, an antipathy to a manmade disruption, is Barron’s vision for the future of our intersection. Barron's outline for the project: Changes are coming to Street Road’s immediate area, parts of which retain a fading air of the rural idyll. Such changes are reflected in - and caused by - developments to its main arterial, Pennsylvania Route 41, which will someday possibly develop into a dual carriage way, and will probably soon gain new traffic lights, or even large roundabouts, if alternative proposals are heeded. The ‘Supervene Forest’ is an antipathy to these manmade disruptions. It begins with the planting of over 1000 acorn seeds to create a forest of indigenous, and storied, Penn Oaks on Street Road’s site, at the intersection of Routes 926 and 41. ‘supervene’ – ‘to happen unexpectedly in a way that interrupts, stops, or greatly changes an existing situation’. The Supervene Forest will spring up, as if from nowhere: trees will appear, to bar the planners’ dream. Historically forests have been considered a barrier to human encroachment; their scale, a daunting foe to humanity. The repetition of tree upon tree has made them almost unnavigable and they have spawned numerous myths and folklore throughout the world. My notion of a forest is metaphorical: my intention is to make an event in nature for Street Road, all of which could one day even displace the Art project space itself. It is important to note I don’t intend the word ‘event’ as in an art context: rather I intend it in the context of nature: like the hatching out of cicadas every 17 years to fool the birds, this happening surprises even us, the initiators. There are two approaches philosophically to considering an Event in nature; one is ontological, the other transcendental. My choice would be to look at the phenomena of an event as supernatural, spiritual, and logic-defying – even sublime. It would be a contradiction to suggest this is not a ‘happening’ or art event: that is obviously a phase of this work. The gathering of seed and planting will occur at a certain point and will involve a group of people; however, this should in no way supersede the idea itself or the natural spontaneous event of germination and the birth of a forest, which is understandably out of the control of the artist. Any farmer will tell you that once he has sown his seed it is up to nature as to when germination will occur. When Lily Cox-Richard rode shotgun on a truck for a whole year with her then trucker boyfriend, she was struck and moved by the realities of life on the road. Over the Road is a series of belt buckles inspired by the people she met, engraved with images and stories that are part stark elegy and part road folklore. In Binelde Hyrcan’s short film, Cambeck Cars, four children re-enact traffic on a quiet beach in Angola, facing the ocean and away from the viewer. Their carefree make-believe belies global disparities in socioeconomic realities. Michael Massaia’s haunting photographs of trucks at night pays homage to one of Route 41’s most contested and frequent group of visitors. Seeing the black dog is a saying truck drivers use to describe hallucinations that occur as a result of sleep deprivation during cross country runs. When they see the “black dogs” scampering across the highway they know to pull over and get some sleep. The moment they make that decision is when I sneak up to their trucks and capture the moment the dogs melt away. All of the images from this series were taken with 8”x10” and 4”x5” cameras and black and white film - between the hours of 2am and 6am along the New Jersey Turnpike. Cy Kuckenbaker turns southern California’s infamous traffic into a hypnotic river-like flow of color. The source footage for this video is a 4-minute shot from the Washington Street bridge above State Route 163 in San Diego, captured at 2:39pm Oct 1, 2013. Kuckenbaker's aim is to reveal the color palette and color preferences of contemporary San Diego drivers in addition to traffic patterns and volumes. There are no CG elements, these are all real cars that have been removed from one sample and reorganized. As the primary public transport in Tokyo, the underground currently connects 285 stations via 13 lines, and more than 6 million people use this system every day. Through its 90-year history, both railway and underground passages have expanded and therefore each station yard has become complicated, the whole resembling a colony of ants. Moreover, due to structural deterioration, some aged stations are now facing redevelopment and routes are rapidly changing. In such a situation, even a regular user of the underground can get lost and needs to look for signs to the destination. This artwork features the Tokyo underground in a transition period and represents the sights of an imaginary visitor, forging a path through this huge labyrinth. David A. Parker’s Enskyment, an outdoor self-portrait made of bird seed, is a meditation on mortality and time, inviting traffic of a different kind altogether to our site in Cochranville. Enskyment features a sculpture made of birdseed that is a cast of the artist’s head. A camera that is part of the sculpture, takes photos of birds that stop by for a meal. The goal is to capture the process of the sculpture being taken into the sky by the birds. MAP Office - Laurent Gutierrez and Valérie Portefaix MAP Office is a multidisciplinary platform devised by Laurent Gutierrez (1966, Casablanca, Morocco) and Valérie Portefaix (1969, Saint-Étienne, France). This duo of artists/architects has been based in Hong Kong since 1996, working on physical and imaginary territories using varied means of expression including drawing, photography, video, installations, performance, and literary and theoretical texts. Laurent Gutierrez is an Associate Professor at the School of Design, The Hong Kong Polytechnic University where he leads the following Master programs: Environment and Interior Design, Design Strategies, and Urban Environments. Gutierrez is also the co-director of SD SPACE LAB. Valérie Portefaix is the principal and co-founder of MAP Office. After receiving a Bachelor in Fine Art, and a Master of Architecture degree, she earned a Ph.D. in Urbanism. She is a Visiting Assistant Professor at the School of Design, The Hong Kong Polytechnic University. MAP Office projects have been exhibited in major international art, design and architecture events including the Venice Architecture Biennale (2000, 2008, 2010), the Istanbul Biennial (2007), and the Venice Art Biennale (2007). Their publications include: Unreal Estates of China (2007); The Parrot’s Tale (2007); My PRD Stories (2005), HK LAB 2 (2005); Mapping HK (2000); among many others. Their first film, City of Production, has been selected for the official competition at: the 38th International Film Festival Rotterdam 2009, the 33rd Cinéma du Réel Paris 2009, 1st Migrating Forms New York 2009, and presented at: 10th Rencontres Internationales Paris/Berlin/Madrid (2008). Maider López was born in 1975 in San Sebastian, Spain where she lives and works. She was graduated from the Faculty of Fine Arts at Bilbao (1998) and received an MFA from Chelsea College of Art and Design, London (1999). Lopez enjoys creating interventions in spaces, situations and architecture. Her works often involve the active participation of the viewer and can take the unprepared by surprise as an aspect of a familiar space mischievously highlighted or altered. She has exhibited extensively throughout Europe and abroad. Some of her works include: 51st Venice Biennale (2005); Columnes, Caixa Forum, Barcelona (2006); AdosAdos, Guggenheim Bilbao, Spain (2007); SCAPE Christchurch Biennial of Art in Public Space, New Zealand; Line of sight, Zendai Moma Museum, Shanghai (2008); Sharjah Biennial 9, United Arab Emirates (2009); Between you and I, Witte de With and Skor, Holland and Eclats at Centre Pompidou Metz (2010). Emily Artinian is founder and director of Street Road Artists Space, and considers the Street Road project to be an extension of her own art practice. Her work is held in the collections of Tate Britain, the Victoria and Albert Museum, and The Art Institute of Chicago, among others. Current focal points are: real estate as art, detritus, ownership, money, and messing with distinctions between artist, subject, audience, and convener as much as possible. She was Senior Lecturer on the Chelsea College of Art Foundation Course from 2003-2010, and at Byam Shaw, Central Saint Martins Art & Architecture Foundation from 2006-2008. She holds an MA with Distinction in Artists books from Camberwell College of Art, and an MA and BA in Russian Literature from Yale and Columbia Universities respectively. Felise Luchansky is a visual artist who works in photography, collage and installation. She received the Delaware Division of the Arts Fellowship for Works on Paper, and has had solo exhibits at the Delaware Center the Contemporary Arts and the Mezzanine Gallery. Her award winning work has been shown in numerous juried exhibits and publications and is held in various private collections. A member of InLiquid, Felise is currently participating in the Sketchbook Project (Brooklyn NY). In 2012 she co-curated, with Emily Artinian, The White Cube Cube, a small-scale exhibition in a mini-fridge, which traveled to Great Britain in 2013. She studied at the Pennsylvania Academy of the Fine Arts and holds a BA in Art History from Rutgers. www.feliseluchansky.com. 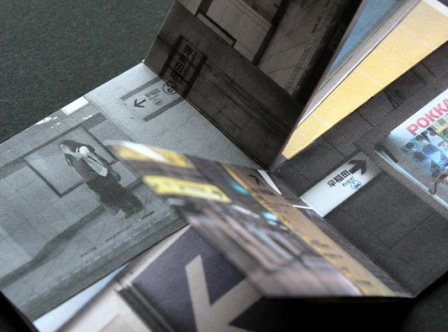 Maya Ohashi (b. Tokyo) is a Book Artist, Editor and Graphic Designer. After working for a design studio in Tokyo, she studied at Camberwell College of Arts at the University of the Arts in London, earning an MA in Book Arts in 2012. She currently works as a freelance designer and artist in Tokyo. She also researches the structural development of printed media and regularly holds book-binding workshops to encourage people's curiosity about making books. Maya creates artworks in book form in terms of a particular aesthetic perspective, thinking of readers as travellers, or ‘book tourism’ as she calls it. Through books, readers expand their imagination and discover new knowledge, which often leads to the start of new activities. This basic role of books corresponds to a process of planning a trip: absorbing information, calling up images of the destination with a great anticipation, and perhaps facing the fact that one will encounter that which they do not expect during actual travelling. Izumi Takeyama (b. Tokyo) studied at Musashino Art University, earning a BA in Scenography, Display and Fashion Design in 2005. Working as a travel, food, lifestyle and bridal photographer she is currently based in Tokyo. From 2013 to 2014, she lived in Germany to make the photo books "In der Nacht" and "Bis morgen!" and also worked as a bridal photographer in Paris. During travels in France, Switzerland, Greece, the United States (New York and Hawaii), Indonesia, Hong-Kong, Singapore and Thailand she took many photos, and held photography exhibitions. In her work she wants to capture not only objects, but also rhythm, sounds, atmosphere, wind, light and life. After her travels a new focus in her work is natural light - she writes: "...in Tokyo there are many artificial lights and too much information and people - I think, "How can I capture these funny, strange sights?" In Europe I found many beautiful sights and was struck by the particular character of natural light, such that now, I work to find something similar in Japan. At the same time, I always want to travel abroad to make new, beautiful photo works." Michael Massaia is a fine art photographer and printmaker who has spent the past few years documenting areas and objects that never extend too far from his front door. Isolation, disconnection, and an attempt to put a spotlight on the ordinary are the constants in all of his work. Michael specializes in large format black and white film image capture, and large format Platinum and Silver Gelatin printing. All of his images are one shot scenes (his images are never composited from multiple exposures). Michael works alone and is the sole craftsman from the instant the negative is exposed to the moment the final print is made. ACE exhibition at the Freies Museum in Berlin 2012; ‘Fantasies of Escapism and Containment’ solo exhibition 2012; Rosebud no.7 Very Funny, edited by Ralf Hermes, published by Verlag Für Moderne Kunst, Nurnberg 2010; group exhibition and publication, Art of the Book, Gallery 210, University of Missouri, St. Louis, USA 2010. Binelde Hyrcan graduated from the École des Beaux Arts de Monaco, Pavillon Bosio. His work, which crosses many disciplines including sculpture, design, performance and film, deals with issues of belonging and identity, often amongst geopolitical conflict. Hyrcan has participated in the Second Triennial of Contemporary Art in Luanda, designed a series of chairs for Domeau and Peres and collaborated with musicians Patrice and Matthieu Chedid in videos and events. His street performance “King” was presented in Monaco, Luanda and Maputo. Hyrcan has also directed two short films and numerous music videos. He currently lives in Paris, France and Luanda, Angola and frequently lectures on his work in schools around France. Lily Cox-Richard is a sculptor currently based in Houston, Texas. She earned her MFA in Sculpture + Extended Media from Virginia Commonwealth University, and has exhibited at Hirschl & Adler in New York, Vox Populi in Philadelphia, the Poor Farm in Manawa, Wisconsin, and Kompact Living Space in Berlin. She has received several grants and residencies, including a Smithsonian Artist Research Fellowship, a postdoctoral fellowship in the University of Michigan's Society of Fellows, and residencies at the CORE Program at the Museum of Fine Arts Houston, Millay Colony, and the MacDowell Colony. Adrian Barron was born in Germany and holds both Belizean and British nationality. He studied at Norwich School of Art where he was awarded the Noel Spencer Prize for Printmaking and the NCC award. He later gained a postgraduate degree in Fine Art Printmaking at The Slade School of Art and was given the Duveen Award and also the Duveen Travel Bursary to study Mayan architecture in Central America. He has continued to win prizes for his prints, such as the prestigious British Institute Prize awarded by the Royal Academy. He has been involved in various artists' collectives in Central America and co-founded Belize’s Earth Art Sculpture Park ‘Poustinia’, located in the jungle of Belize on the border with Guatemala. He has taught in various public and private institutions in the UK and abroad, such as EEA Estonia, Byam Shaw School of Art and Central Saint Martin’s in London, and is currently teaching at the Working Mens College in London. Barron considers himself to be an artist who makes prints and site specific works, exploring the notion of the multiple and its variable distortions in Nature and Humanity. He has exhibited extensively throughout the world, and this travel aspect of viewing new environments and cultures feeds back into his search for abnormal fluctuations in things which are accepted as the norm. David A. Parker makes art across media to engage with the question, “Life is short, so what is important now?” Based in Philadelphia, he studied at Cornell University and the School of the Art Institute of Chicago, and has exhibited in galleries and museums in Germany, South Korea, China, the UK and the USA. He is represented by Kasia Kay Art Projects in Chicago.